Feeling a little “off” lately? Maybe it’s your glasses. Having an outdated prescription can lead to a number of health complications. These can be anything from blurry vision, dizziness, to severe headaches. These and other less obvious symptoms like squinting while working at a computer can suggest you need glasses. Lessening the likelihood of these complications is simple. Having your eyes checked yearly by an eye care professional can avoid all of these side effects and more. An eye exam is a simple and painless procedure. Your ophthalmologist or optometrist will perform testing to look into your eyes. There will be a machine that will shine a light into your eye to get a picture of the back of your eye. You may sit at a machine that blows a tiny puff of air to check for eye pressure. If necessary, your eye doctor will put a solution in your eyes to make them stay dilated and take the pictures again. Your ophthalmologist or optometrist will then give you a vision test with the letter board we are all familiar with. You will then sit down in the chair and the eye doctor will use an instrument known as a phoropter to determine if you have a prescription. They will put different lenses in front of your eyes and ask how clear you can see through them. After this process is complete, the eye doctor can write a prescription for corrective lenses, if necessary, or send you on your way until next year. For something so simple, it’s a wonder that so many people avoid it for so long. Eye examinations should be an important part of your annual medical checkups. Here is the list of the top reasons stressing the importance of timely eye exams. It’s important to start getting eye exams at a young age and on through adulthood. Don’t be afraid of seeing your ophthalmologist or optometrist. Children should start getting a yearly exam with an eye doctor as soon as they start school. In fact, school may be the first time a child will notice a vision issue. If your child is complaining that they can’t see the board, you should take them in for an exam. Just because they passed the routine vision screening at school or their pediatrician’s office doesn’t mean they have perfect vision. Getting regular eye exams don’t have to take a ton of time. Make sure you arrive at your appointment on time. While you wait to see your eye doctor, peruse frames you may like should your prescription change. Feel free to ask staff any questions about lens options. Most people believe that getting your eyes checked guarantees the financial burden of purchasing new glasses. This is not always the case. If your vision hasn’t changed and you take good care of your eyes you may not need to get a new prescription. Some prescriptions can last for years and still be effective. Even though your prescription itself will expire, as long as nothing has changed, your ophthalmologist or optometrist will give you a renewed prescription and you can go home in your same glasses or contacts. Getting an annual vision screening test and comprehensive eye exam can make sure your ophthalmologist or optometrist catch any issues early. Being able to catch anomalies before they become bigger problems means less treatment time and a faster recovery. Detecting conditions early can help slow it from progressing. For instance, if you develop astigmatism you will be given a correction in your lenses. This can slow down, or stop, the progression of your astigmatism. What’s better than free? 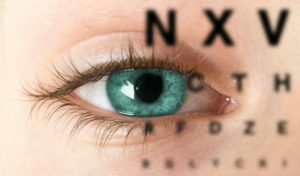 If you are paying for vision insurance coverage you should get a free yearly comprehensive eye exam. Check with your insurance carrier or a staff member about the benefits your plan offers. Paying for the insurance and not getting your eyes checked is like throwing away money. Some insurance planswill pay for a whole pair of glasses, once a year as well. Use your insurance, don’t throw your premiums down the drain! While it is a myth that using an old prescription lens will damage your eyes, it can cause other complications. The main issue is eye strain. Using the wrong, or an old, prescription lens means your eyes will be working overtime trying to clear up the picture for you. This constant extra work causes severe eye strain which can result in major headaches, vertigo, and other issues. If you never go to the eye doctor you’ll never know how far vision technology has come. There are new specialty contact lens options that can better fit your lifestyle. You can choose from glasses with lenses that become sunglasses when you’re in a bright space or outside. There are daily, weekly, monthly, and long-term wear contact lens options. You have the choice to change your eye color with colored contacts. There are seamless bifocals without that second little window in the middle of the lens. Technology now is able to get you a more accurate vision prescription than ever before. Depending on your insurance, you may have a reward program that gives you money back for preventive care. You receive this incentive by getting all of your annual check-ups. If you check all the boxes, they will make a deposit into your health spending account or even credit a premium payment to your account. This list usually includes your annual physical, an annual OB/GYN exam for women, an annual eye exam, and annual dental examination. This is a huge incentive to see your medical team regularly and make sure you’re doing great. While the other reasons on this list are nice, this reason is the most important: comprehensive eye exams can save your vision. Imagine life without your eyesight. What would it be like to never see your kids again? To lose your independence and no longer be able to drive? To require the use of assistance aides to make your way through everyday life? That is not something anyone wants. A simple yearly eye exam can help prevent the loss of your vision. If that’s not a reason to get into the office maybe this last one will convince you. Your eyes aren’t just the windows to your soul. Your eyes can provide valuable information about other health problems that are going on in your body. Diabetes – One of the very first indicators of diabetes is changes in the tiny blood vessels in the eyes. These vessels can take on a yellowish color or even start leaking blood. Even before diabetes shows up in your bloodwork it can lead to these eye changes. High Blood Pressure or Hypertension – Again, the blood vessels of the eye tell this story as well. If there are bends or crimps in these delicate vessels it can indicate high blood pressure. The blood is pumping so hard that it collapses and kinks up the vessels in the eyes. Autoimmune Diseases/Disorders – If your eye is swollen and inflamed this can be an indication that there may be an autoimmune issue. The main disorder this points to is Lupus but could be other autoimmune disorders as well. Elevated Cholesterol Levels – A yellowing of the cornea and the surrounding area can be a clue that you could have high cholesterol. The doctor may also be able to see a buildup of plaque in the blood vessels. Thyroid Disease – If your eyes are bulging of their sockets this is a major indication of thyroid disease. Neck Tumors or Aneurism – Having a neck tumor, or a ruptured tumor can cause your eyes to have droopy eyelids. This can also change the shape of your pupil. Cancer – This is something that the eye doctor is going to be vigilant in looking for. Cancer can be indicated based on a change in eye shape. If your eye doctor observes an odd eye shape they will refer you to a specialist. There is a form of eye cancer, called ocular melanoma, that can occur in the cells that make up what we perceive as eye color. Eye exams can also help find skin cancer. A lot of carcinomas will start on the eyelids. These can be noticed during the exam and you’ll be referred to a specialist. Wear Sunglasses – This may seem obvious, but wearing sunglasses protects your eyes from the damaging UV light of the sun. They can prevent eye strain as well. Even on overcast days, it’s a good idea to wear sunglasses while outdoors. Eat A Balanced Diet – Eating a diet rich in omega-3 fatty acids and leafy greens are fantastic for your eye health. Try adding cruciferous veggies into every meal. Eat more fish, like salmon, to boost your omega-3’s. Take Proper Care Of Your Contact Lenses – Pay attention to the instructions your doctor gives you to take care of these lenses. Not treating them with care can lead to eye infections, ulcers, and even blindness. Take Breaks From Your Screens – The easiest way to cause eye strain is to stare at a computer screen too long. But, with our jobs being so computer based now, it’s hard to avoid. Make sure you are giving your eyes a rest break at least every 20 minutes to avoid discomfort. Quit Smoking Now – There are still people out there who deny the proven harmful health effects of smoking. It also has a horrible effect on your eyes. Smoking can cause a number of vision issues like cataracts, macular degeneration (which means you’ll be blind eventually), and permanent damage to your optic nerve. Along with all of the other dire health concerns smoking causes, quit it as soon as possible. As tedious as it seems, your yearly eye check up is an appointment you should keep. The benefits far outweigh the small inconvenience and time commitment. Your vision is one of your most precious senses. Protect your eyes, take care of them, and you can avoid a lot of complications. Check out our blog here for other ways you can avoid common eye diseases. Ready to get into an eye doctor now? The doctors and staff at Magruder Eye Institute are here to help. Click here to request an appointment right away.